The High Park Project at Wivelscombe, near Taunton has been helping children to learn brass instruments in a variety of ways, including monies raised from selling recycled clothes. 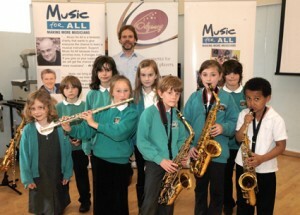 Music for All were able to donate a whole range of brass instruments to the project, in partnership with Odyssey instruments from John Hornby Skewes. Print article This entry was posted by admin on May 23, 2012 at 4:05 pm, and is filed under Music for All. Follow any responses to this post through RSS 2.0. You can leave a response or trackback from your own site.